“Whether the Revenue Commissioners availed fully, properly and in a timely manner in exercising the powers available to them in collecting or seeking to collect the taxation due by Mr. Michael Lowry and Mr. Charles Haughey of the funds paid to Mr. Michael Lowry and/or Garuda Limited trading as Streamline Enterprises identified in Chapter 5 of the Dunnes Payments Tribunal Report, and any other relevant payments or gifts identified at paragraph (e) [of this Tribunal’s Terms of Reference] and the gifts received by Mr. Charles Haughey identified in Chapter 7 of the Dunnes Payments Tribunal Report and any other relevant payments or gifts identified at paragraph (a) [of this Tribunal’s Terms of Reference]”. As I mentioned on the 18th December, that is at the last sittings, the evidence to be given by Revenue Officials will throw some light on other aspects of the Terms of Reference and in particular, Term of Reference (a), which deals with payments to Mr. Charles Haughey. 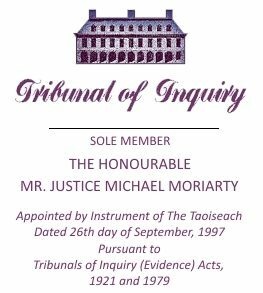 (I should say that there will be a separate opening statement at a later point dealing with Mr. Michael Lowry and his relationship with the Revenue Commissioners in connection in the first instance, with the payments found to have been made and mentioned in the report of the McCracken Tribunal.) You will recall that it was pointed out on the 18th December that the manner in which a taxpayer treats his assets or resources in the context of his obligations to the Revenue Commissioners may provide some useful evidence upon which to base the characterisation of the circumstances in which those resources were accumulated; and it is those circumstances which, in addition to the fact of payments, which the Tribunal must scrutinize under Term of Reference (a). To date, the Tribunal has focused on Mr. Haughey’s relationship with the Revenue Commissioners in a broad way but under a number of different tax headings. This was done with a view to examining the different points of contact between Mr. Haughey and the Revenue Commissioners. That exercise has nearly been completed, though in the light of evidence which will be given over the next few days, it may be necessary, as I have already mentioned in December, to revisit some of these areas and indeed at these sittings, it may be necessary to revisit some of the evidence given in December. In the evidence which will be given at these sittings, the Tribunal will be examining aspects of the Revenue Commissioners treatment of the disposition by Mr. and Mrs. Haughey of the lands at Abbeville Kinsealy to their children by way of gift in 1989. The issue to which the Tribunal has directed its attention is the valuation of those lands for the purposes of assessing the liabilities of the donees of that gift, that is to say the liability of Mr. Haughey’s children (who are connected persons within the meaning of the Tribunal’s Terms of Reference) to Capital Acquisitions Tax. “Capital Acquisitions Tax,” therefore, is the heading or point of contact to which the Tribunal will be devoting its attention at these sittings initially in any case. This assessment to Capital Acquisitions Tax involved the valuation of the lands in question in 1989. This valuation issue is one to which previous dealings between Mr. Haughey and the Revenue Commissioners in the first part of the 1980s are relevant. Evidence has been given at this Tribunal in relation to an assessment made by the Revenue Commissioners to Capital Gains Tax arising on the forfeiture by Mr. and Mrs. Haughey of a purported deposit by the Gallagher Group of £300,000 in respect of a purported purchase of part of the lands of Abbeville. From information made available by the Revenue Commissioners, it appears that on the 15th March of 1989, 227 acres of the lands of Abbeville Kinsealy were transferred by Mr. and Mrs. Haughey to their four children. Ms. Iris O’Donovan, Assistant Principal Officer in the Revenue Commissioners, who was working in the Capital Taxes Division between October 1986 and January of 1993, has informed the Tribunal that she became aware of the transfer of the lands from Mr. and Mrs. Haughey to their children when the relevant papers were referred to her on the 14th November of 1989 by the stamp duty branch for the purpose of pursuing the matter of possible gift tax claims. When the documents relating to the transfer of land were submitted to the stamp duty branch for stamping, that branch had referred the value of the land submitted by the Haughey family’s tax agents to the Commissioner of Valuation for an opinion of value, both for stamp duty and gift tax purposes. The valuation offered by the agents in 1989, at least for stamp duty purposes, was £750,000 for 227 acres of the lands. Now, in fact, there were four donees and therefore, strictly speaking, four separate assessments to Capital Acquisitions Tax and this was the aggregate of the valuations submitted by the various donees, i.e. the Haughey children, on their self-assessment gift tax returns. What I should say at this point is that, in fact, the £750,000 valuation was offered in respect of a valuation for stamp duty purposes. That valuation was referred to the Valuation Office and was increased to 1.2 million. The valuation submitted by the Haughey children for Capital Acquisitions Tax was the £1.2 million valuation. Now, that valuation was, of course, submitted to the Revenue Commissioners by the tax agents, Messrs. Haughey Boland, and they were the same tax agents who were dealing with Mr. Haughey’s tax affairs and indeed with some of the land transactions connected with the purported forfeiture of the Gallagher deposit and the later Revenue assessment to Capital Gains Tax in respect of that deposit in the early to middle 1980s. The Revenue Commissioners, in any case, proceeded to deal with the gifts on the basis of the valuation placed on the land by the Valuation Office, that is £1.2 million. It will be obvious, in the light of evidence given to the Tribunal by the Revenue Commissioners and by others at its sittings in December and indeed at much, much earlier sittings, that a question which arises at this point is as to how it could have been determined in 1989 that these lands ought to have been valued in the first place by the Haughey family at £750,000 and in the second place, by the Haughey family and by the Valuation Office at £1.2 million, when, as we know, Mr. and Mrs. Haughey and their advisers were involved in a purported disposal of part of the lands in January of 1980 at a valuation of £35,000 per acre. If that 1980s valuation had been applied to the lands in 1989, a value in or about £8 million would have been the result. Ms. O’Donovan has alluded to this matter in the information she has provided to the Tribunal and has stated that it is her understanding that the 1980 contract between the Haughey’s and the Gallagher Group involved a possible Capital Gains Tax liability and that this was handled by the office of the Chief Inspector of Taxes. Ms. O’Donovan has informed the Tribunal that the matter was not referred to the Capital Taxes Division and that that division, therefore, was unaware of the 1980 contract at the time of the valuation in 1989 for the purposes of stamp duty and gift tax. Mr. Christopher Clayton, who has already given evidence, and who was the official in the office of the Chief Inspector of Taxes dealing with the Capital Gains Tax matter in the middle 1980s, has informed the Tribunal that he had an involvement in this matter. By that I mean that he had an involvement in the gift tax issue. It would appear that in 1985, and presumably arising out of his dealings with the Capital Gains Tax issue in relation to the Gallagher deposit and also in relation to Rath Stud, he became aware of the fact that Ms. Eimear Haughey had had the free use of lands at Abbeville for her business and that she had also obtained interest free loans from her father. He communicated with the Capital Taxes Branch indicating that these matters could give rise to liability for Capital Acquisitions Tax and indeed, ultimately and presumably on foot of Mr. Clayton’s communication, Ms. Eimear Haughey was assessed to Capital Acquisitions Tax in respect of what was, in effect, a gift by her parents to her of the commercial use of the Abbeville lands and a Capital Acquisitions Tax liability on the interest free and quite substantial loans made to her by her father. These liabilities to Capital Acquisitions Tax were also relevant in determining the extent to which Ms. Eimear Haughey would become liable to Capital Acquisitions Tax on the disposal by her parents to her, together with her other siblings, of part of the lands at Abbeville in 1989. This is because the thresholds below which no liability could arise, would have to be calculated by taking account of the aggregate of the value to Ms. Eimear Haughey of the portion of the lands transferred to her in 1989 and also the value of the earlier benefits she had obtained by way of a gift from her father and mother in connection with the commercial use of the land and the interest free loans I have just mentioned. Obviously, had Mr. Christopher Clayton’s communication to the Capital Taxes Branch in 1985 included information concerning the Capital Gains Tax liability on the so-called Gallagher forfeited deposit, this would have, or at least it would appear that this would have had a radical impact on the valuation of the lands for stamp duty and Capital Gains Tax purposes in 1989. It may well be asked why this information was not apparently available in the Capital Taxes Division, but Mr. Clayton has informed the Tribunal that as the tax liability on the Gallagher deposit arose under the Capital Gains Tax Code, there was, in his view, no need to advise Capital Taxes Branch of the possible liability to Capital Gains Tax, meaning that there was no need to alert the section dealing with Capital Acquisitions Tax to the fact that there had been a contract for the sale of part of these lands with a value in 1980 of £35,000 an acre. Apart from the potential value of this information in evaluating the circumstances in which payments were made to Mr. Haughey, the further examination of the manner in which these Capital Gains Tax and Capital Acquisitions Tax matters were dealt with is relevant, not only in the context of Term of Reference (j), but also in a more general way in the context of Term of Reference (m), which requires the Tribunal to make whatever broad recommendations it considers necessary or expedient for maintaining the independence of the Revenue Commissioners in the performance of their functions, while at the same time, ensuring the greatest degree of openness and accountability in that regard that is consistent with the right to privacy of compliant taxpayers. The question which arises is whether any recommendations are appropriate in the light of the information to date that it would appear that information which was highly relevant to the determination of a liability to Capital Acquisitions Tax on the disposal of Abbeville in 1989 was in the possession of the Revenue Commissioners but not available to the actual officials of the Revenue Commissioners charged with the specific responsibility of making that assessment to tax. At some point in these sittings, it may also be necessary to further examine the facts and circumstances surrounding this assessment to Capital Acquisitions Tax in 1989 in the context of the Tribunal’s obligation to make whatever broad recommendations it considers necessary or expedient under Term of Reference (o) for the effective regulation of the conduct of their members by such professional accountancy and other bodies as are relevant to these Terms of Reference for the purpose of achieving the highest degree of public confidence. In addition, in these sittings, the Tribunal will also deal, initially, by way of an overview only, with the collection by the Revenue Commissioners of the taxation due on the payments found by the McCracken Tribunal to have been made to Mr. Haughey and, at a later point, found to have been made to Mr. Lowry. A significant amount of documentation, in Mr. Haughey’s case, firstly, has been made available to the Tribunal by the Revenue Commissioners recording the dealings between the Revenue Commissioners and Mr. Haughey in connection with the collection of this tax. The Tribunal has decided that it should take some further time to examine this information in the context mainly of the light which the Tribunal believes it may throw on the sources of information concerning payments to Mr. Haughey and other aspects of Mr. Haughey’s financial affairs and on the circumstances in which payments were made to Mr. Haughey. This is an examination which is pertinent to Term of Reference (a) and, of course, to the findings which the Tribunal is charged with making under that Term of Reference. Now, I hasten to add that that submission or objection, if you will, is one which comes solely from Mr. Haughey’s solicitors, Messrs. Ivor Fitzpatrick & Company and not from the Revenue Commissioners. The Tribunal has written to Mr. Haughey’s solicitors indicating that it notes their position, but that it does not accept that the settlement between Mr. Haughey and the Revenue Commissioners of Mr. Haughey’s Capital Acquisitions Tax liability on the gifts received by him as identified in Chapter 7 of the McCracken Report falls outside its Terms of Reference and the Tribunal takes the view that on the contrary, this matter falls directly within the ambit of paragraph (j) of its Terms of Reference, and indeed as I have already mentioned, may throw light on some of the circumstances which ought to be scrutinised in the context of the Tribunal’s obligation to report under Term of Reference (a) of the Terms of Reference.